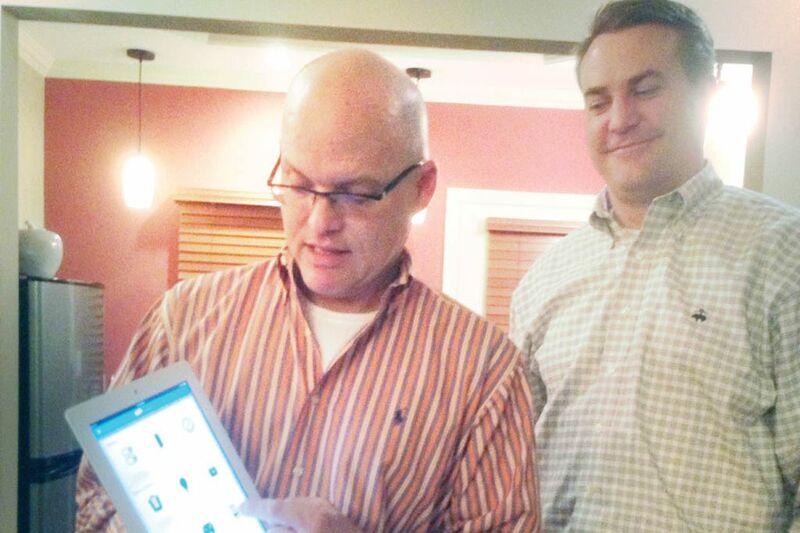 Zonoff CMO Bob Cooper and CEO Mike Harris show off their software steering the Staples Connect home automation system. LAS VEGAS - HAL, do we still have a problem? As the sneaky computer character in the classic sci-fi flick "2001: A Space Odyssey," you put out those malevolent, controlling vibes. But now, in 2014, you're no scary villain - you're the dude! In fact, you are resonating all over this week's International CES tech fest, here in Vegas - although in a much kinder, gentler fashion. There's a new catchphrase going round - "The Internet of Everything," or IoE - to describe human codependence and willing surrender to the global networks, deep data banks, tracking technology and eerily predictive software that help steer today's high-tech goods and services to give us what we want, when we want it. There's even a new home automation system named HAL debuting at the consumer electronics show. HOME CONTROL 101: Malvern-based software developer Zonoff is looking like one of the heroes of the IoE age, with its new, master-control home-automation system, rolling out first at Staples shops and website as the Staples Connect. This easily installed, just $99 central hub and cloud-based backbone allows consumers to mix and match more than 100 smart-home products designed for competing and previously incompatible systems (Z-Wave, ZigBee, Lutron). All are easily integrated on an Internet-connected, app-loaded smartphone or tablet: Honeywell Wi-Fi thermostats, Schlage internet-monitored door locks and new smart lightbulbs (co-developed by Coopersburg's Lutron and GE), to name a few, explained Zonoff chief marketing officer Bob Cooper. Only connected security gear requires a monthly monitoring fee. At CES, Zonoff is also demonstrating a prototype television with its smooth operator built in as an app. "You'll see it in lots of smart TVs within a year or two," hinted CEO Mike Harris. As for the voice- and motion-controlled HAL, it's really more a personal home-entertainment assistant. Think Xbox One, without the games and at 40 percent the price. Then there's the equally name-grabbing Mother, by Sen.se, working with small sensors sprinkled around the house and glued to everyday goods to monitor and trigger stuff. Like when your feet hit the ground next to the bed, the coffeepot turns on. Samsung is also hopping on the Smart Home bandwagon at CES with its vision of a voice- and tablet-activated control system that can lord over the mega company's many products, from TVs to kitchen appliances. WALL-E WORLD: Long-established hi-fi and video specialists, like Philadelphia's World Wide Stereo, are taking an "adapt or perish" attitude to changing tech currents, noted chain CEO and CES regular Bob Cole. His stores are now equally "design centers" showcasing home-control products, like motorized, programmable blinds. And he's finding "best of both worlds solutions" with Internet streaming music players from Sonos and Lenbrook "that can plug into your classic McIntosh amplifier." "Sonos is five years ahead of competitors in software development," Cole noted. "And the new Lenbrook system's cool, because you can feed in CDs that are then transferred to its hard drive and automatically logged in the program software. You never have to pull them out again." At this CES, Cole is also shopping for "home health-care monitoring products that allow a distant doctor to keep track of your vitals and well-being. It's a big growth field." MORE TO THE POINT: Famibot, from automatic vacuum-cleaner maker Ecovacs, is the first Web-connected home robot worth his weight in Bitcoin. Remotely triggered by a smartphone app, he monitors movements in the house and invites a faraway you to see and talk with whoever's there. Famibot also turns lights on and off, and acts as an air purifier and smoke detector. The same maker also has a new robotic vac that can be remotely cued (via your phone) to clean up the joint before you bring company home. SOUND ON: Multiroom Wi-Fi sound systems that wirelessly stream subscription music services, Internet radio channels and streaming podcasts are making a big buzz. Samsung is showcasing a greatly expanded Shape line. British maker Pure is increasing content offerings with Sirius/XM and unique Bluetooth networking capacity. (Beam music to one Pure product - enjoy on all.) Panasonic, Altec-Lansing, Definitive Technology and Polk also will spread good sounds around an abode. Philips is introducing a handy-dandy, multitasking TV Surround Base that sits under the TV, pumping up the volume with better speakers and amp. With just one connecting cable, it also plays Blu-ray discs from a built-in drive, pulls down Philips Smart TV Internet apps and captures wireless music streaming in via Bluetooth. The most unlikely music maker of the year has to be a new Whirlpool refrigerator with onboard "CoolVox" sound system enabled by Bluetooth tech. Now your food can sing.